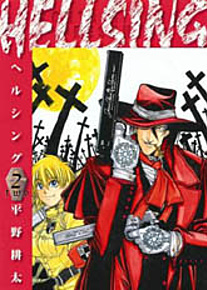 Hellsing continues with more blood, guts, ghouls, and gothic murder. Created by Kohta Hirano, and making its way into an incredibly popular anime, Hellsing pushes the boundary of horror, yet looks so visually stunning and graphically cool that instead of being scary, it's super fun. Certainly not intended for younger readers, this series follows the Hellsing Organization, an old institution created by English royalty to squash the ghoulish undead of the world, as they face an insurgence of murderous monsters running rampant across the isles, fueled by...could it be...Nazi's? Watch the dark story unravel as Digital Manga Publishing presents Hellsing volume 2.